Old friend disappears in Sydney airport | Where to next? A serious timepiece in Oklahoma. 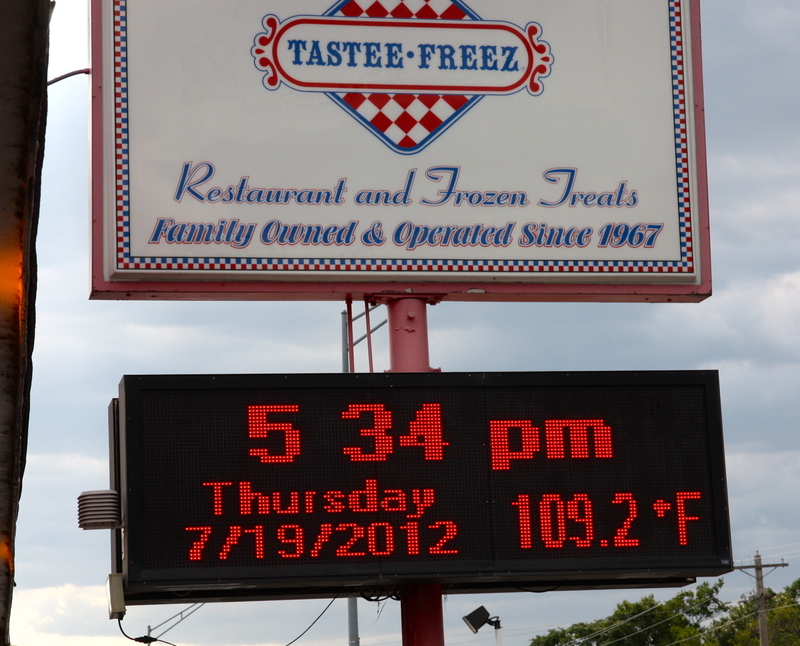 And yes, it really was 109.2°F (42.8°C) that day. We were striding toward a departure gate yesterday in Sydney’s Kingsford-Smith Airport and suddenly I realised my old friend was gone? No, not Poor John, but my 10-year-old watch! Oh crap! This was a blow. We were heading off for six weeks in India and the trusty watch I bought in 2003 had vanished. Poor John reckoned I’d left it at check-in or put it my pocket after I noticed it was out by a couple of minutes and took it off to reset it. But I clearly remembered checking the time at least 10 minutes after resetting it. I reckon the pin on the watchband fell out and the watch simply followed it to the terrazzo floor. Poor watch, and I never even thought to give it a name! I bought it on around-the-world travels when I searched and searched and searched for a water-resistant watch with decent-sized numbers. I found this one in Chichester in the UK. Cost me 27 pounds. Since then I’ve worn it travelling overland through at least 60 different countries on all seven continents. It didn’t do much except tell time. If I had to write a missing watch notice it would say—‘gold-coloured watch, has largish face, second hand and stretchy wristband, keeps good time’. It started getting a little unreliable before our last overland trip in South America. It would run fine for a while and then suddenly lose an hour for no apparent reason. We changed the battery but the behaviour continued. It took me a couple of weeks to figure out that it only lost time when I took it off for longer than about 10 minutes—yes, I wore that watch to bed even though it didn’t light up in the dark. I tested this theory a few times and was really quite sure this was the reason, because it wasn’t a movement-operated watch. Poor John just laughed at this theory and urged me to buy a new watch, which I did a couple of days before we left for South America. I put the old watch on notice and the new watch in my backpack. It stayed there for the whole trip, and my old gold number ran just fine. Last week it lost an hour when I inadvertently left it on the bed for most of a morning, but otherwise it had been completely fine for months. Yesterday it jumped or was accidently pushed from my arm! I’ll never know if it smashed to the floor or bounced and was picked up by a new owner. I wonder if it will run for them? Poor John said, I don’t suppose you thought to bring the new watch? Well yes, I did, and pulled it out of the backpack where it had lain for months and put it on. 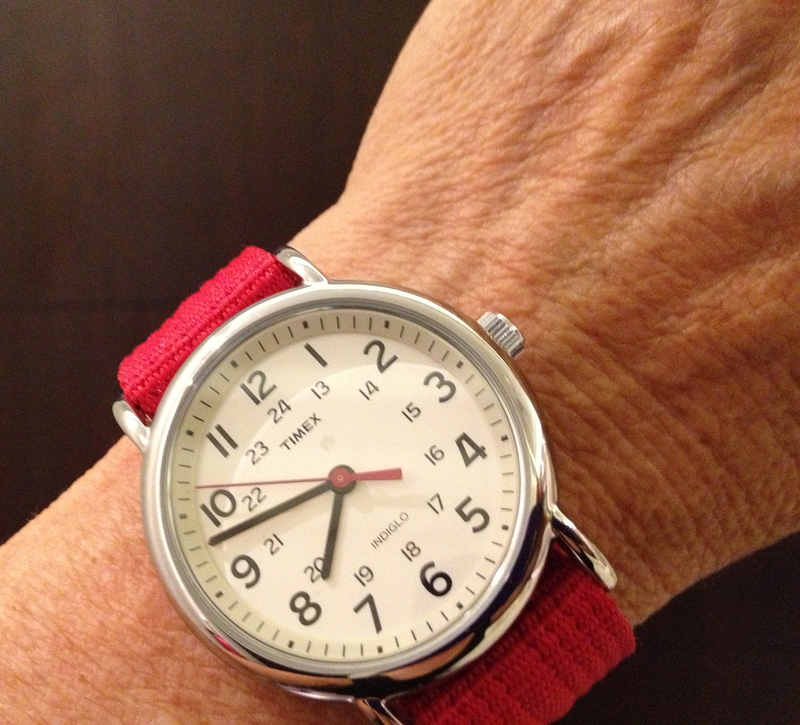 It’s fashionable—a wide red wristband with a buckle, silver finish—and so far the time seems accurate. The numbers are big enough I should be able to read them from across the street. Plus, there’s a second hand and a light. But I reckon a watch this big should be like Poor John’s and tell me the temperature, altitude, direction, day of the week, month and where I am in the world. Maybe I’ll buy one of those next time. Goldie, what a perfect name. Thanks. Hi Joanne. It was interesting that it disappeared at the start of a new journey. I hope it carries on with someone who needs a watch. Sorry am I indeed to hear that you’ve lost your trusty old watch. This new one looks vey shmich indeed though. The red band is very attractive and the face and numbers are plain but elegant. Are you sure though that you’re not asking a little too much of it by expecting it to do all of the things that Poor John’s watch does? I just think something that big should probably do more than keep time and light up. That said, I bought it, and I am very happy it’s not digital. I feel sad and yet happy. I guess it was ready for new adventures. I really hope it has survived to live on someone else’s wrist. I keep hoping that if the finder is nice, the watch will soldier on for years to come, and if they aren’t nice, it will stop and never run again. Naughty me! Sorry to hear about the watch loss, especially as it had been through so much with you! I was told to keep my (very cheap neon plastic) watch hidden in South America for fear of theft, is there any truth in that? My watch, which was kindly named Goldie earlier today, went with me everywhere in South America. I think the only risky place is Salvador in Brazil, and you wouldn’t want to wear anything out there, especially at night. I have a similar Timex that replaced a Seiko that cost ten times as much that took a licking and stopped ticking when run through a laundry. It doesn’t tell me much more than time to the second because I don’t bother setting the day and date feature (can’t read them anyway…), but it gets me through the day. I’ve stopped spending money on quality watches and stick by the cheap ones with readable faces. The light-up face is a nice feature on these watches, eh?! That’s about as fancy as I need in a watch. Laundries tend to do a job on watches. Years ago, one of my cats knocked my watch off the dresser into the heat grate on the floor. It went straight into the furnace and was never seen again—the watch,, not the cat. With this new watch, I think the light will come in handy on our travels. Otherwise, the time is all I really need. Being left handed, the first think I noticed is that your new watch is on your left hand, so you must be a right handed person. Also, you are getting older and therefore a larger watch face. Sales on wrist watches is down, because many younger people tell time using their cell phone or ipad etc. An experienced world traveler and camper like you and Poor John should be able to tell time by the angle of the sun on the horizon. I love the theory/observation that it dropped an hour if you took it off for too long. That’s one emotionally-attached timepiece! I hope the new one counts the hours for a long time to come. I like your post on losing your own watch. Not that you lost it, but that you, too, wrote about the experience. Can’t say I had a real sentimental attachment to mine, just so puzzled as to how it disappeared and the fact that, yes, it did seem emotionally attached to me. I don’t think it would have had an emotional response if I’d lost it a month earlier or two months later, it was bad/good timing in my case. All these wandering objects, it makes you think maybe those animated movies of objects going on quests were right after all! Same at my house. Most wandering objects are being carried/hidden by four-footed friends. When it comes to tracking them, you have to think like a dog. Delhi dishes up my favourites—a savoury breakfast and a memorable view | Where to next? Watch-ya wanna buy in Tehran’s big bazaar? | Where to next?